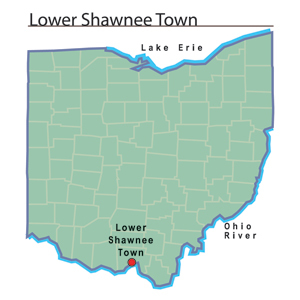 About 1738 the Shawnee built a town at the mouth of the Scioto River which they called Lower Shawnee Town, one of the earliest Shawnee settlements in Ohio. The site became a center of trade with first the French and then the British colonists of the Ohio Country during the eighteenth century. British traders from the colonies of Pennsylvania and Virginia established trading posts at a number of American Indian towns in Ohio during the mid-1700s, including Lower Shawnee Town. These trading posts threatened French economic interests in the region. When Celeron de Bienville led his expedition to lay claim to the Ohio Country for the French in 1749, he chose Lower Shawnee Town as one of the sites to bury lead plates that made the French claim official. This was a rather direct way to introduce the European concept of land ownership into the Ohio Country. When floods destroyed the town during the winter of 1752-1753, the Shawnee rebuilt Lower Shawnee Town on higher ground, on the site of modern-day Portsmouth, Ohio.